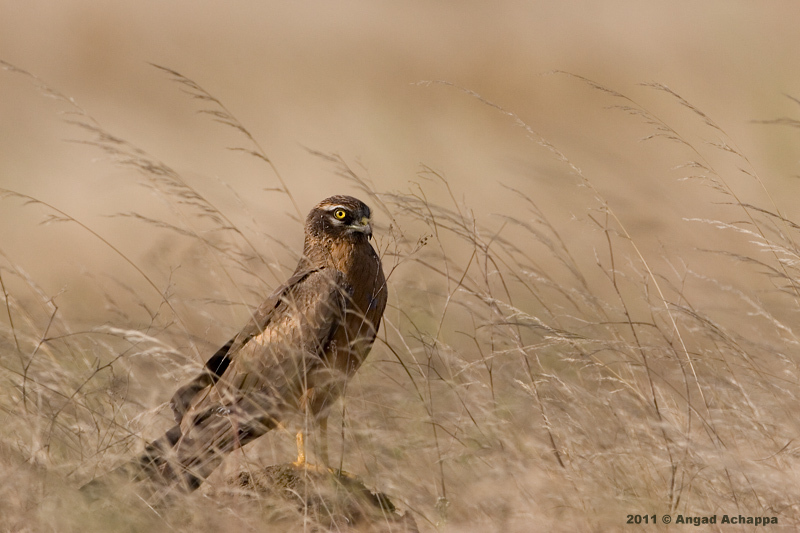 This handsome bird is a young male Pallid Harrier. As an adult, this bird would show a very different coloring(whitish-grey). They are winter migrants to parts of Europe and Asia, especially India. he's beautiful. love his sharp eye. OUTSTANDING portrait of this BEAUTY...!! Wonderfully captured behind the golden moving grass.....!!! SUBLIME, Angad!! All my very best wishes for the coming new Year & looking forward to come back and admiring your magnificient & unique Wildlife Photography! A wonderful bird I have never seen before. Look so elegant. Great shot and light. Have sent you a new mail about NL. Nice pic, however, not of a Pallid Harrier. The total lack of a pale collar - to mention one important feature fits Montagu's Harrier better in this csse. Thank you so much for the info, I had initially put it up as a Montugu's only, but a lot of other photographers and birders commented saying it was an immature male Pallid.